Neatishead tower windmill was quite a small 4 storey tarred red brick mill that was built during the first quarter of the 1800s to replace an earlier postmill. 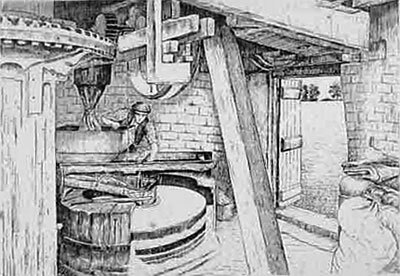 The mill stood to the south of the village in a farmyard surrounded by low outbuildings. 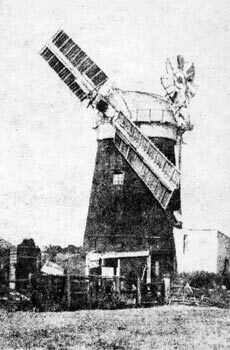 The mill had a Norfolk boat shaped cap with a petticoat, gallery and a 6 bladed, left handed fan that was installed c.1845. In later years an external pulley wheel was visible that was used to supply power via an auxiliary steam engine that was first installed in c.1883. An excellent BRICK TOWER WIND MILL working two pair of stones, a flour mill and cylinder with all other necessary going geers in good condition, a dwelling house contiguous with out buildings and an inclosure of good arable Land adjoining, containing about half an acre and other appurtenances. The above estate is situated in Neatishead, is copyhold, fine certain and of greater part thereof immediate possession may be had. Apply to Mr. Daniel Mack of Neatishead or to Mr. Rust, Solr. at Ludham. The sails drove 2 pairs of underdriven French burr stones situated on the first floor, a flour mill and jumper. A cylinder was recorded in 1827. The all wood great spur wheel had a gearing ring on its top face for an auxiliary drive. The square, wooden upright shaft was chamfered. The stone nuts were taken out of gear by removing a 3 cog segment of the iron nuts and a bell alarm was operated by a damsel. 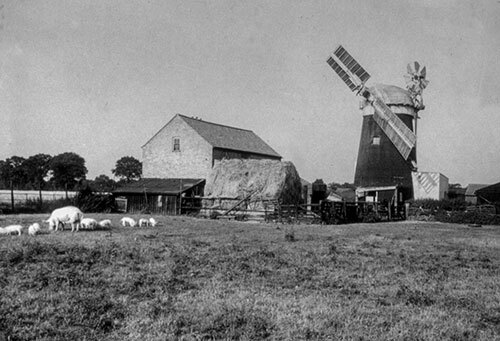 A TOWER WINDMILL situate at Neatishead in Norfolk, within one mile of a Navigable River, now in full Trade and capable of manufacturing sixty quarters of Corn per week, ten and a half yards of sail and two pair of French Stones, a Flour mill and Cylinder in good repair, a Cottage, Stable, Cart lodge on the Mill (?) and a good Dwelling House ... and good outbuildings adjoining the House. Also a piece of Land. Neatishead joins Horning and is nine miles from Norwich. It is a good Corn Country. To be Sold by Auction Unless sooner disposed of by Private Contract of which due notice will be given. A Capital Brick TOWER MILL in full trade etc. four floors, Flour Mill, Cylinder, two pairs of French Stones, beautiful Dwelling, Garden, Barn, Stable etc. The Purchaser can at a very low rent have 8 or 10 acres of rich Arable Land. Possession at any time required as the present occupant has another engagement. Neatishead is a beautiful Village 9 miles from Norwich, 1 mile from the road to Yarmouth. Lot 2. A General Shop where an Extensive Trade has been carried on for many years. Further particulars in next week's papers. Tower Windmill, Dwelling House and Shop at NEATISHEAD in Norfolk To be Sold by Auction by Wm. Butcher at the Bull Inn, Magdalen Street, Norwich on Saturday June 17, 1837 at 3 o'c. Lot 1. A good Brick TOWER WINDMILL driving two pair of Stones, with Flour Mill and Cylinder, also a comfortable Dwelling house, Garden and Stable adjoining, situate at Neatishead in Norfolk and now in the occupation of the Proprietor, Mr. Hammond. 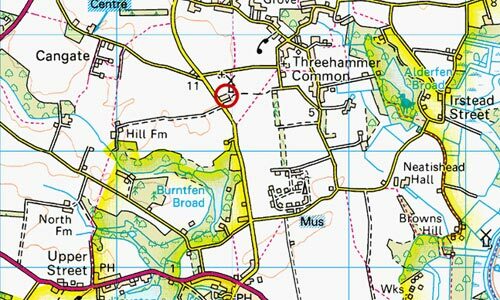 The Purchaser of the Mill may be accommodated with 8 to 10 acres of fine Arable Land. near thereto at a moderate rent. Apply to Mr. Massey, Solr. Watton, Norfolk or Mr. Butcher, Auctioneer, Norwich. To be Let for a term of years with Immediate Possession. A good and substantially built Brick Tower Windmill driving two pair of Stones, with Flour Mill, Jumper, Machinery and Going Gears complete, together with a Dwelling house adjoining situate in Neatishead, Norfolk, and now in the occupation of Mr. Hammond. Neatishead is within a short distance of the Navigation to Yarmouth. The Tenant can be accommodated with 10 acres of Arable Land if required. Apply to Mr. Hammond or to Mr. Massey, Solr. Watton. A capital Brick Tower Windmill with Dwelling house, Garden, Stable and other Outbuildings adjoining, situate at Neatishead in Norfolk. Apply to Mr. J. S. Cann, Solr, Wymondham. An excellent Brick TOWER WINDMILL situate in Neatishead in Norfolk with Dwelling house, Stables and other Outbuildings. The Mill has two pairs of Stones and has lately been made to wind herself and otherwise improved and put in repair. Possession may be had at Old Michaelmas next. Apply to Mr. J. S. Cann, Solr, Wymondham, Norfolk. Capital Pony, Mill Carts and part of HOUSEHOLD FURNITURE of Mr. C. Harris (who is changing his occupation). 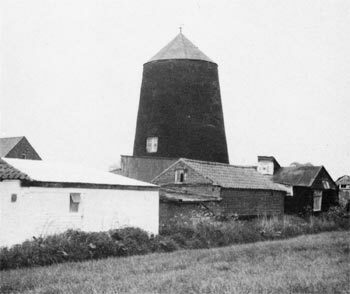 A Capital TOWER WINDMILL with Dwelling House, Stables and other Outbuildings. A well built brick TOWER WINDMILL driving two pairs of stones with ample stowage for corn on the basement floor, three Upper Floors (31st August advert read: A Well built WINDMILL driving two pairs of stones with a Capital Roundhouse) and the requisite machinery for carrying on a lucrative business. Also an excellent brick and tiled Dwelling House ... occupied by Mr. Samuel Grapes, a highly respectable tenant at the annual rent of £35. NB. Two thirds of the purchase money may (if required) remain on mortgage at 4%. Particulars of Messrs. Bailey & Howlett, Solrs. Wymondham or of the Auctioneer, Carleton Rode. A well built BRICK TOWER WINDMILL in excellent repair driving two pairs of stones with ample stowage for corn on the Basement floor, three upper floors and the requisite machinery for doing a good trade. 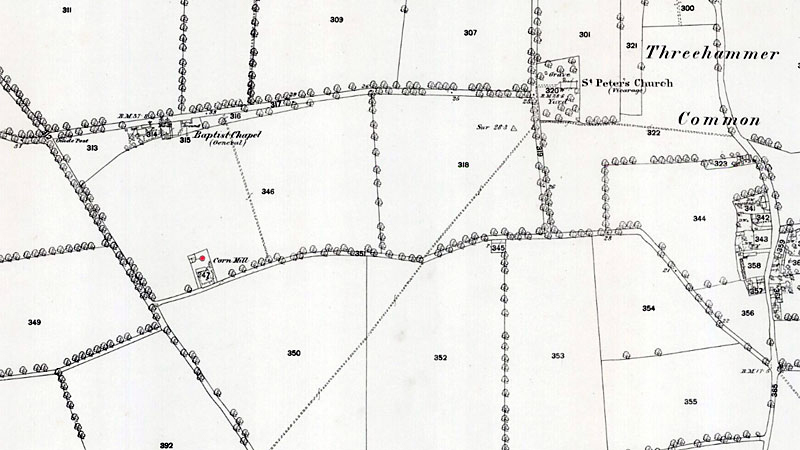 Also an excellent Brick and Tiled Dwelling House ... with a very productive plot of Garden Ground at present occupied by Mr. B. S. Shepherd who will give possession on completion of purchase. Particulars of Mr. E. C. Bailey, Solr. Surrey Street and the Auctioneer, Rampant Horse Street, Norwich. To Let a Brick TOWER WINDMILL, Dwelling House, Gardens etc. at Neatishead. Rent £14. Apply to Mr. E. C. Bailey, Solr. Norwich. To LET a BRICK TOWER WINDMILL, Dwelling House, Garden etc. at NEATISHEAD. Mr. Jacob Scarland, who has been in business for 20 years at Neatishead, in Norfolk, having decided to retire, his brick tower windmill with patent sails came to the hammer on the 22nd. ult., and found a buyer in Mr. J. Wisbey at £430, with an extra £50 for an 8 h.p. portable engine. ... Neatishead, where there is a small tower mill without a gallery (stage) which works regularly in spite of the fact that it has lost two of its four sweeps. A small steam-engine is used as an auxiliary to supply power when there is no wind.